The Trunk is available for educational purposes from the History Museum on the Square, through the Museum's Traveling Trunk Program. Museum staff will deliver the trunk to locations in and around Springfield, Missouri. Teacher Feedback: "My students loved the trunk and they loved getting to hold and see the materials provided. 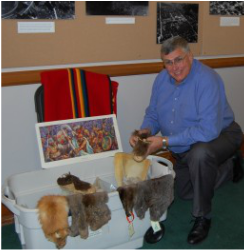 It was a great idea to have small versions of the pelts because every kiddo wanted to hold one and they were plenty for each...Thank you for the effort that was put into these resources!"